Our second day in Paris was action packed! We hopped the metro to our first stop, the Louvre, once a medieval fortress, now the world’s largest museum. We were told the lines would be long to enter, and that we could be here all day, so we arrived early and we hit the highlights, because we had several highlights in Paris to see today, and we were going to be hard pressed to see all of them. Once again, we were lucky, and we ended up in the line that forms from inside the mall, and it was only three minutes long! After we bought the tickets, we joined the masses and headed toward the Mona Lisa which is mounted on a wall behind glass. I had always heard how small it was, and it was actually larger than I expected, though I’m not sure what all the fuss is about…she didn’t smile at me! Along with the Mona Lisa, we admired a variety of sculptures including Aphrodite, Phsche and Cupid, Captive, and Saint Mary Magdalene. We also simply enjoyed the architecture and design of the Louvre, both inside and out, as well as old and new. We followed the escalator out through the famous pyramid and posed for a few photos before we moved on to our next stop, Sainte-Chapelle. The Sainte-Chapelle, built between 1242 and 1248, is a gem of high gothic architecture and consists of two sanctuaries, one on top of the other. Originally, only the king and his close friends and family were allowed in the upper sanctuary which housed famous relics while palace staff worshipped in the lower chapel. The lower chapel is home to statue of the Virgin Mary as well as the oldest wall painting in Paris, while the upper chapel owes its fame to its 15 stained glass windows. The 1,113 scenes depicted on the windows tell the story of mankind from Genesis through Christ’s resurrection. In addition to the 15 windows, the western rose, illustrates the Apocalypse of St. John. The windows were magnificent and worth our longest wait in line thus far. Now it was time to enjoy a little R&R at a café overlooking the Seine…our French had not improved. After our lunch, cheese crepes, we got some ice cream at Berthillon on the corner. I had the best chocolate ice cream, and Theresa had the best pistachio ice cream ever as we strolled to Notre-Dame. Construction on the cathedral began in 1163 and didn’t finish until 1345. The sacristy on the south side of the choir houses Notre-Dame’s treasures: medieval manuscripts and the Crown of Thorns. While the line was long to enter this attraction, the longest line of the day was to the public WC, even with the attendant singing, “Pee Pee rapide” while hoping for a tip. Perhaps she should have cleaned the bathroom a bit! From Notre-Dame, we took the metro all the way across town to the Arc de Triomphe. We really have mastered the metro. We even knew when to wait on the elevator versus climbing the ninety “marches”. We learned that the hard way the first time! It doesn’t sound like much, but tack on jet-lagged and 12 miles a day and think of climbing 90 stairs. The Arc de Triomphe was truly a pleasant surprise. All the pictures make it look so small. It was enormous and so intricately carved! I just loved it. We only had time to wander around the outside which was truly breathtaking. I can’t imagine what the inside had to offer. Napolean conceived the Arc as a symbol of his military power in 1806, but it wasn’t finished until 1836. Beneath the Arc, is the Tomb of the Unknown Soldier, installed in 1921 after World War I. Again the monument, used in several of France’s commemorations, was amazing. I don’t know where the time went, but it was almost five, and we had late-night show tickets to Moulin Rouge, the only tickets we had pre-purchased despite suggestions otherwise. 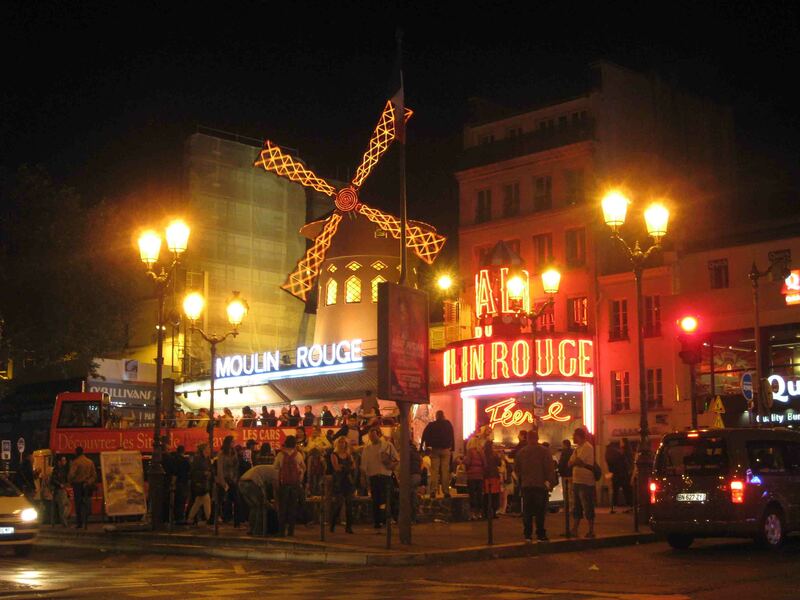 After freshening up at the hotel, we took the metro to Montmartre to try a restaurant listed in our guide book, Café Burq. The bartender greeted us in French, we smiled, and I responded, “A table for two”. Here’s what your mother and I did in Paris: SHOPPED.